Maybe you have heard of it that people stay at home and make money with a website and asked yourself how they do that? Well, I am one those. Here I like to tell you how this website makes money and most of all….HOW YOU CAN DO THE SAME! let me tell you my story and give you help in understanding how this whole making money with a website works. I have a full legal page that you can read here. I can imagine that you do not like to read that whole thing so here is what it is about. The pages on betterpricedonline.com can have what is called affiliate links on them. (Don’t worry I will tell you later all about that). These links can make me money. They will however never add and extra costs to the readers of this website. I do not get paid to write any information on this website and every opinion is totally mine. Okay, That was the legal MumboJumbo. Now I can tell you how I make money with this blog. 2 How Much Can You Make With Blogging? 3 How Much Does Blogging Cost? 4 Is There Help To Get Started? 5 Let Me Help you! Several years ago I got interested in building a website. I wast the owner of a small restaurant and decided that it needed a website. After talking to people who could do that for me and found out about there prices I thought I would give it a try myself. That was back in 2007 and started a whole new adventure in my life. It changed my life and I sold my restaurant later and now I live of the money I make online with this and other websites. This is what some people call being a “blogger” and I guess that is what I am. If people hear that I stay home and make money doing this blogging thing the next thing they ask is. HOW YOU CAN I MAKE MONEY LIKE YOU DO?? If you have the same question, or just are curious, YOU CAME TO THE RIGHT PLACE. I will answer the most asked questions on how to make money with a blog. When you land on a website and you read that it contains “affiliate links” you have basically found how that site makes money. The do what is called affiliate marketing. This is a totally free way for bloggers to make money. It is also the way I make money with this website. In short, affiliate marketing is finding things you are interested in, share them on your website and make a commission if someone buys that product. There are many other ways of making money but this is how I make money here on betterpricedonline.com. Have you ever heard of an online store called Amazon.com? I am sure you have! This is basically what I do all day. I go “shopping” on Amazon to see what people are looking for and than share it here on my blog. Finding and writing about things that OTHER people should buy. I think I have a pretty awesome job! I will answer a few questions that most people ask me when they find out that I work for myself as a blogger from home and make money that way. I love to answer these questions because I don’t anyone who could not use extra money. Anyone can have a blog like mine to add some extra money to their wallet! It is also very nice to be your own boss! I work when I can and not when I have to!!. I can spend a lot more time with my family. How Much Can You Make With Blogging? It is perfectly natural that everyone ask me HOW MUCH you can make blogging and how much I make wit this blog. The second question is always how long it took me to start making money. The firs thing you have to know is that it did not happen overnight. Unless you win the lottery there are no “become a millionaire” things. But it happened pretty fast. The cool thing is that it even makes money while I am not working on it. You know why? Because the internet is open 24/7 and every day of the year. That is one of the other questions I get a lot. This is a normal question but there is one thing when I answer this question. NO ONE believes me when I tell them how much it cost to start a blog like this. Starting a blog cost about $5 a month!! Yes, that is not a typo!! FIVE DOLLAR A MONTH!! Really, that is all it takes to start your own website and make money with it. TIP! You can find the cheapest way to get started here – My five dollar a month promise! Is There Help To Get Started? When I read this question I assume you are looking for FREE HELP! If you have to pay for it my statement of $5 a month would not be true. There are basically two things you need to start a website like I have here. This is where your website will live and be put on the internet. The domain name of this website is betterpricedonline.com. I have registered this name and no one in the whole world can use this anymore. At the cheapest company I use this will cost you $15.95 each year and Under $4 A month for the hosting. I TOLD YOU!! ABOUT $5 A MONTH TOTAL!! Finding a name for your website is not hard. Just type in your idea and see if it is available. If yes, register it. If not, try a new option. TIP! You can find the way I got started here – MY FIVE DOLLAR A MONTH PROMISE! Did I miss anything? let me see! 2. 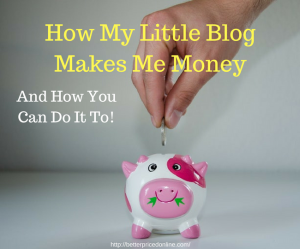 How Much Can You Make With Blogging? 3. How Much Does Blogging Cost? 5. Is There Help To Get Started? Free! If you have any question that you would like to ask me feel free to contact me through our contact page here!